I can’t believe I’ve managed to not write about this until now, it’s all I’ve been talking about for months now! Next April is our 10th wedding anniversary, so we’re planning to renew our vows and have a big party to celebrate. The renewal of vows will be a private day, on the anniversary itself, which is a Thursday. We’ve booked a ceremony in the register office, then we’ll go somewhere really good for lunch, just us. Then, on the following Sunday, we’re planning afternoon tea for 70-100 people, in a grand house called Lackham House, near Chippenham. For a reasonable charge we get exclusive use of the ground floor rooms and the gardens, which are extensive. Of course, planning a party for April comes with an assumption that the weather could do anything from scorching sun to snow. But whatever, it’ll be a pretty venue anyway. For food we want just traditional afternoon tea goodies – small sandwiches with no crusts (to include cucumber of course), individual cakes and of course tea/coffee. We’re planning a glass of bucks fizz on arrival and hopefully we’ll get a musician to play something classical in one of the rooms. It’s so exciting, but I can’t believe it’s still over 7 months away! We’ve both bought outfits – A got a tux and has ordered a customised shirt and I have a new dress (thank you M&S sale), shoes and a big white hat. In view of the new shawl, everything else has taken a bit of a backseat. I finished the cross-stitch picture for my cousin’s baby though…photos when I have framed it. So, this week coming…work, with extra responsibilities as the rest of the team are on holiday. Tonight we are off to Alan and Kat’s for dinner, which is always fun. Then I have a scan on Weds to determine whether the suspected hernia really is a hernia or something else entirely. And I think that’s about it. 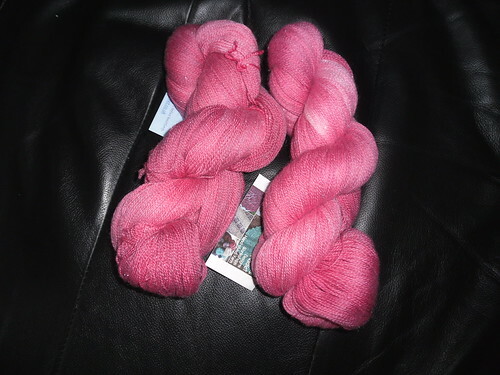 This entry was posted on September 3, 2011 at 10:08 am and is filed under knitting. You can follow any responses to this entry through the RSS 2.0 feed. You can leave a response, or trackback from your own site.